For some reason I can't run my NXT Pro 2 in Win 7 Ultimate anymore. It keeps giving me error: "Critical Registry Keys Needed For This Application Are Missing" and ask me to contact Tech Support. Even I have reinstalled the application. Is there anyone has the same issue? How can I resolve this? Try the NXT one first ~ reboot and attempt to install. You MUST reboot before install for it to work! DG, glad you were able to get LR up and running. trying to capture video from tape inpu. Was getting Visual C++ Runtime error. Now getting message critical registry key missing. now, "Critical Registry Keys Needed For This Application Are Missing"
PS DG, link above in "HERE" takes me to a page where NXT and NXT Pro links are inop, and NXT 2 is not listed. Edit Sorry, I misread the issue (inop). I didn't understand that the links were inoperative (not found). 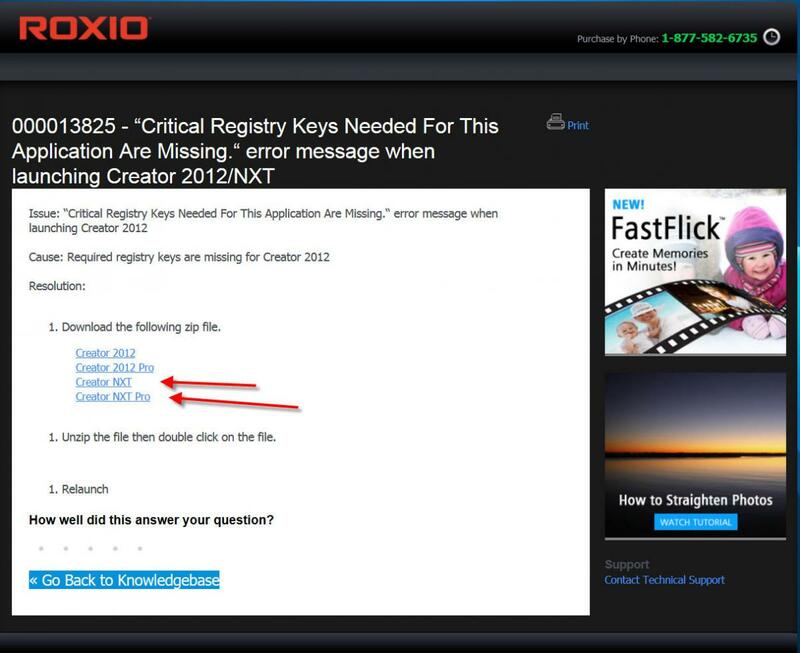 Steve, I just checked, and the links for Creator NXT are indeed broken. They don't come up with anything. The links for Creator 2012 do work. I've sent Rox-Ralf a PM about it. Steve, I just checked, and the links for Creator NXT are indeed broken. The link isn't broken when I click on it in my post # 2! CD, the links are there, they "work" to the point of pointing to a page, but they don't bring up a file to download like the links for Creator 2012 do. It eventually comes up as a "broken" page. I get similar results with IE and Firefox too, now that you ask. I see C2012 is on a different server than NXT is. I remember this happening a long time ago, so I saved a copy of them. Here are the missing files, grab the one you need. Brendon, Thx for your post. Would any one of these be recommended for Creator NXT 2? 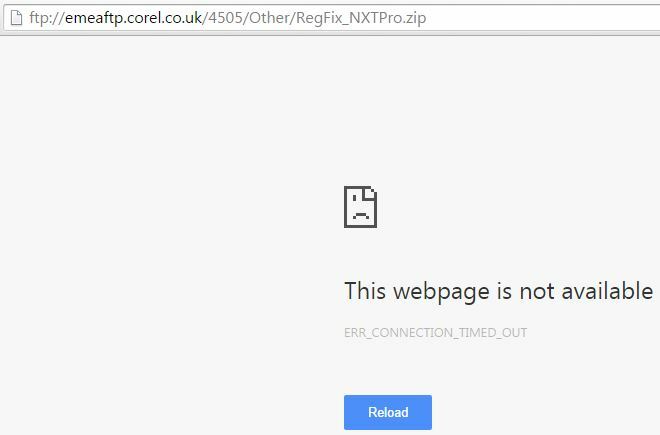 BTW, ran RegFix_NXT_64-bit to no avail on Creator NXT 2; still receiveing "Critical registry keys needed for this application are missing." The registry keys referenced in those various "regfix" files vary greatly from one version to another and one O.S. to another. I'm trying to pick where they might occur in Creator NXT 2, but if I'm going to be of any help to you (and that's by no means certain) I'll need to know what Roxio suite you're running, and which Operating System you're running it in [name and x64 or x86]. It's going to be a huge job, so don't get your hopes too high. Now, that is what I really appreciate, Brendon... a no BS answer! Thank you. THank you for caring, looking at this and not over-commiting to any more than that! I think I've done it. Do you know how to send/receive private messages on this bulletin board? I think this next bit of testing is best done by email, so I'll send you my home email address in a PM and we can carry on that way. For the interested spectators, I'll come back here and explain once we've tested it. For those interested, Paul was also talking with Corel Support. They guided him through a 'Clean uninstall and Reinstall' of the software, and that fixed his issue. I had built an NXT2 regfix file to repair Paul's registry, but we never got to try it on his system. Any suggestion as to which RegFix file I should use? Also, I'm wondering what affect this has on the end product? More to the point, could this be the root of unexpected outcomes on a DVD burn? I've had a ton of issues (DVD opening to a sub-page instead of the title page; missing audio on some, but not all clips; next button going other than where I've set it to go, etc.) and am wondering if this could be at the root of it? I've reworked this project many times trying to fix any potential problems and wasted 20+ DVDs with inferior end results (not matching previews - which in itself is maddening) and am about at my wits end with Roxio. Any help would be much appreciated. Last question first - I think this has been caused by some sort of event which has broken several parts of your installation and is causing all these problems, rather than this is the root of all those problems. This is why I recommend a clean uninstall - full uninstall; thorough cleanup; reinstall without Anti-Virus or background programs running - rather than slapping a field dressing (RegFix) on the wound. When some key registry values are damaged, the program alarms and gives you that error message. Roxio's RegFix file replaced only the values which were causing the alarm and not the root cause of their being broken. Perhaps that's why Roxio only issued RegFix files for only two versions of Creator? In any event, I made a RegFix for Paul's NXT 2 under 64-bit Windows 7 and it worked under test on my machine, but we didn't get to test it in the field because he did the full uninstall; thorough cleanup; reinstall and it fixed the problem. Should you wish to try the quick, temporary fix, here it is. I'm afraid the Community Forum Software by IP.Board 3.4.8 is playing up again at the moment and we can't upload the file to you here. I'll type it in and tell you how to make it work. NOTE: This for Creator NXT 2 under Windows x64 only. Save the text as a file such as RegFix.reg to your desktop or somewhere you can find it. To use the regfix file you've created, double-left-click it and answer yes or allow to the Windows questions. Reboot the machine to restart Windows. This should have replaced those 'Critical Registry Values', but I still recommend the clkuean uninstall/reinstall. To your last question, when you're preparing your project to go to DVD, instead of writing directly to DVD, instead select the option to write to a Folder Set, or to a .ISO Image file. Once those are created, you can then preview those files. If they match what you expect, then you write those to disc. (No rendering required at that point.) And if those don't play properly, then the problem is with your discs or DVD burner.